Technology has invaded every business, and the restaurant industry is no exception. The traditional method of pen and paper to take orders is slowly being replaced by technology such as PocketTouch. 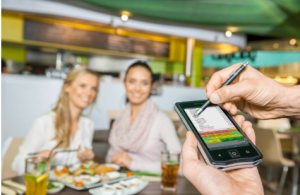 More and more businesses are turning the way of mobile POS systems to bring their restaurant into the future. An increase in efficiency which in turn leads to better customer service, decrease in errors while order taking and a unified flow throughout the entire dining experience are just a few of the reasons that more and more restaurants are turning to technology. Keeping staff on the restaurant floor results in a higher volume of tables being handled without impacting the quality of service, that translates into fewer servers needed per night. Tablets virtually eliminate server trips to the fixed POS station to enter orders which takes around 15% of their time.